The premier monthly magazine for those who spend hundreds of hours building railway layouts is Railway Modeller and its edition for February 2018 features Handcross station from the early 1900s. To the delight of the passengers, close by is the Jolly Tanners; anything is possible when you create your own imaginary world! The modeller and author of the article is my son, Darren Ray, who spent his early life in Handcross. An early version of the layout appeared on picture #1699. The February edition of the RM became available in the newsagents yesterday and I am grateful to the publishers for allowing the article to appear here. The above photograph shows a general view of the layout with the station in the background. A short stroll from the station is the Jolly Tanners which can be seen on the Large Version. Select Open Document to view the five-page article. What a splendid model of a beautiful location. I am very interested in obtaining the timetable that Darren mentioned. Do you know where I could find a copy? Thank you, Stuart! I thought I would be able to answer your question easily as the 1959 Railway Modeller article, which includes the timetable, was on a website page called something like 'Modelling Sodor' on the Pegnsean.net site. However, I'm having trouble getting to it at the moment. I shall keep trying to get hold of it. I shall have to buy a copy of the actual magazine perhaps! Stuart, I have now located a copy of the article, and the section on the timetable has been added to the PDF. Select Open Document above and scroll down to the end. 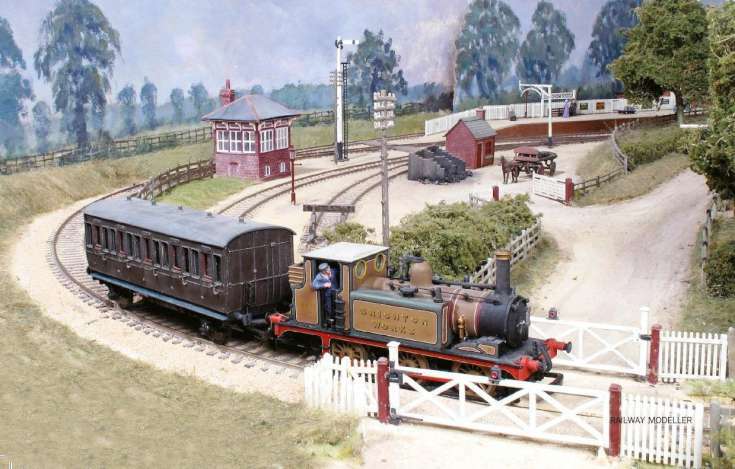 The full article can be viewed by clicking on Links above and selecting Railway Modeller.